Santa's helpers are probably females, say experts at Texas A&M university. You have to love this time of year for the utter surrender of reason in the service of yuletide whimsy. Like how NORAD always has radar of Santa's location on Christmas Eve. That just never gets old. And now, the AP reports that "renowned wildlife experts" at Texas A&M University are spending actual science dollars and brain power pondering the gender of Santa's reindeer. It's always been pretty well assumed that Dasher, Prancer, et al. -- not to mention that showboaty A-lister Rudolph -- were male. 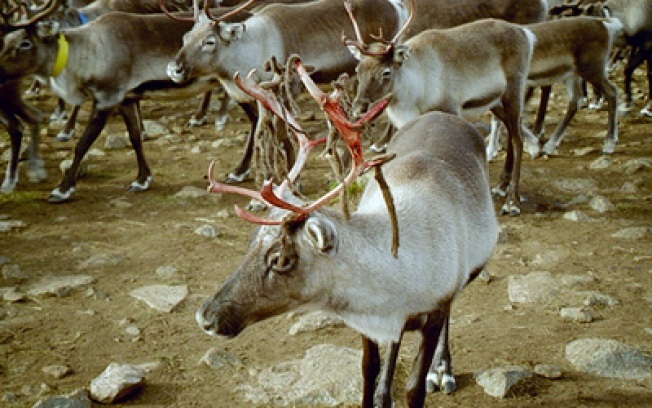 But A&M veterinary medicine prof Alice Blue-McLendon drops this bombshell: "Santa's reindeers were really females, most likely." Countering this whole theory is a rep from the Reindeer Research Program at the University of Alaska Fairbanks (and really, on the topic of reindeer, who're you going to believe? A Texan or an Alaskan?). Greg Finstad weighs in with this rebuttal: they could be castrated males, known as steers, who retain their antlers longer. He adds that at this time of year, the ladydeer would most likely have a bun in the oven, and "you don't hook up your pregnant females to a sled" -- even it's Christmas Eve, even if Santa asks nicely, and even if the precious dreams of children everywhere depend on it.